Current Affairs News | How to Write IAS Mains Exam Answers? Home > Blog > How to Write IAS Mains Exam Answers? 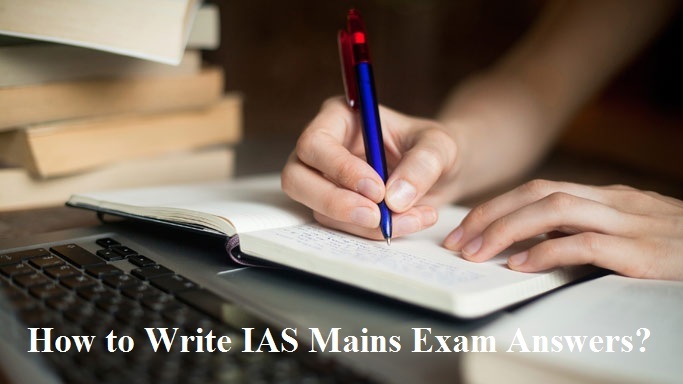 11 Sep How to Write IAS Mains Exam Answers? Worrying about your mains answer writing? Feeling that your answers will not fetch good marks? Your worries and feelings are understandable. Mains exam is the crucial phase of the civil services examination. Every mark earned here will bring you a step closer to your dream job. But, worrying is not going to help in the exam. Constant practice and seeking help enables you to tackle any eventuality. To get good marks and get a sense of how to write mains exam answers, read the following. The first and foremost thing to do while answering is to understand the question properly. Certain keywords in the question give clues to what the question is demanding. Many times, candidates rush into answering the question without reading it. They end up writing crap. For getting good marks write relevant answers as per the question. Toppers and many successful candidates have vouched for giving multiple dimensions to the issue at hand in their answers. In IAS Mains Exam there is no need to prove your scholarly mettle by writing in-depth answers. Giving multiple dimensions in the answer proves to the examiner your ability to analyze and connect things. This is need of a generalist bureaucrat and that is what the exam is testing. Use simple English while writing the answers. It helps your writing speed and avoids wastage of mental resources in searching for vocabulary. Also, flowery language may make the examiner distracted or irritated. Often the point you are trying to make gets lost in such language. You can gain this skill of writing simple English through rigorous practice. Should I write in paragraphs or should I write in bullet points? This is the common dilemma for many candidates. Well, it depends on the type of question asked. For questions where you need to state various aspects, give pros and cons to the topic asked, it is better to use bullet points. Else, you can safely use paragraph style of writing. In the paragraph style make sure that the paragraphs are short and are inter connected. Better still is to use both styles depending on the nature of the question. Be judicious in using them. It is possible to use both in a single answer. Good writing speed enables you to complete the whole question paper on time. This means fetching more marks. Speed coupled with clear conceptual understanding is a recipe for you to become a topper. You can achieve speed only by practice. Write as many mock tests and sample answers as possible to increase your writing speed. To make a point clear, you can use flowcharts, diagrams, tables, underlining specific points or words etc., in your answers. These benefit your overall presentation. Also, the examiner spends less time in understanding the answer and will fetch you good marks. Not all questions require a pictorial presentation. So, be Judicious in using flowcharts, diagrams etc. Use this type of presentation only if you are confident in your skill. Experimenting at the stage of actual exam is a recipe for disaster. Be prepared in using tables, underlining, flowcharts etc., and prior to the actual exam. Specific word counts are mentioned for the questions in the exam. But, the answer sheet has more space than the word count mentioned. Due to this, many candidates try to fill the space. They stuff their answers with unwanted information. This will reduce the chance of scoring more. Do not worry about filling the space. Write the answers within the specified word count and maintain relevancy. Better answer writing skill comes from long hours of practice. Write as many sample answers as possible. Attend as many mock tests as possible. In the initial stages of preparation, experiment with your writing and identify a proper style and stick to it. Make sure that the knowledge you gained is presented through proper words. Some tips before going for the mains exam. Make sure that the pen you are taking for the exam is the same with which you have practiced. The touch and feel of the same pen will ease your nerves during the actual exam. It helps in smooth and fast writing. Experiment with different pens and choose the one that makes your writing easy. Take a clutch of them, one for the actual writing and others as spare. You might have studied tonnes of materials going into the exam, practiced many hours in honing your answer writing skills, but it is the state of your mind during the exam that matters. Do not get overwhelmed or carried away during the exam. Be in the moment and pay utmost attention to the task at hand. Even if the question paper seems to be tough, do not think of the consequences, just keep writing. Gather your mental energy, focus on the question and keep writing.